Multiple personality disorder is a mental disorder in which a person displays two or more distinct identities that take control of behavior in turn. Sybil Dorsett was a 22-year-old college student who had amnesia * . She also had terrible headaches and sometimes could not see, as if she were blind. Upon turning for help to Dr. Cornelia Wilbur in New York, Sybil soon started to show other personalities. It was as if there were more than one person inside Sybil's body. One personality, who called herself Vicky, said she was from Paris. Another personality, called Peggy Lou, was a tough woman who showed no fear. As time passed, Sybil displayed more personalities: a writer, a flirt, a pianist, a mother, and even an infant and two men. Dr. Wilbur noticed that each personality acted and sounded different from the Sybil Dorsett she first had met. Each personality even described his or her physical features in different ways. One said that she had blue eyes, while another said that he had brown. Almost everything, from details about hair color to gestures, changed as Sybil switched from one personality to another. In all, Sybil displayed 16 different identities. Sybil's case became one of the most famous examples of multiple personality disorder after a book about her experiences appeared in the early 1970s. A movie, starring actress Sally Field, later was made. Sybil's story offers a revealing glimpse of an often-misunderstood mental disorder. Multiple personality disorder is a severe mental disorder in which a person displays two or more distinct identities. There can be as many as 100 personalities or more, although most patients display about 10 to 15 different personalities. Each takes control over the patient's behavior for a period of time, usually adopting a unique name, voice, movement style, and life history. * amnesia (am-NE-zhah) is a loss of memory about one or more past experiences that is more than normal forgeffulness. 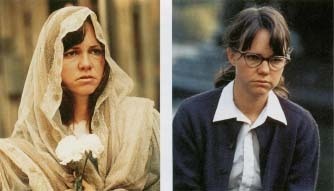 Actress Sally Field portrayed a woman with multiple personality disorder in the film Sybil . only in recent decades. The formal name for the disorder is dissociative identity (di-SO-see-a-tiv i-DEN-ti-tee) disorder. This means that a person's identity is separating into parts, or dissociating, because of the mental disorder. Schizophrenia * is another severe mental disorder. Its name comes from the Latin for "split mind." Often, schizophrenia's "split mind" is mistaken for the "split personality" of multiple personality disorder. In reality, however, schizophrenia and multiple personality disorder are two very different mental disorders with different symptoms, causes, and treatments. The exact cause of multiple personality disorder is unknown, but often patients with the disorder have experienced child abuse. This was the case for Sybil, whose mother caused exceptional trauma * for her when she was young. Doctors see multiple personality disorder as an attempt to cope with particularly traumatic events in a person's life. For example, a child might deal with extreme physical or sexual abuse by hiding memories of the abuse and displaying other personalities. What Are the Symptoms of Multiple Personalities? The first symptoms of multiple personality disorder usually involve amnesia. Like Sybil, people with the disorder often start to realize that there are abnormally long periods of time that they cannot remember. For example, they might "wake up" in a different place or in different clothes, and recall nothing that explains the changes. This amnesia can lead them to suspect that something is very wrong. * schizophrenia (skit-so-FRE-ne-ah) is a serious mental disorder that causes people to have hallucina-tions, delusions, and other confusing thoughts and behaviors, which distort their view of reality. * trauma refers to a wound or injury, whether psychological or physical. Psychological trauma refers to an emotional shock that leads to lasting psychological damage. Robert Louis Stevenson wrote The Strange Case of Dr. Jekyll and Mr. Hyde in three days of frenzied activity in the 1880s. When his wife read the novel, she thought it was so evil that she destroyed it. However, Stevenson simply rewrote it in another three days. The novel is the account of a good doctor who becomes evil when he drinks a potion. Many people now use the terms Jekyll and Hyde to describe individuals who display a two-sided personality, one side of which is good and the other side of which is evil. Patients often are skilled at hiding their multiple personalities from family and friends. A person might be Sam, a shy clerk, at work. However, at night, he might lead life a Jack, an outgoing man who spends time in bars far from his neighborhood. One identity uses the name with which the person was born. This identity often feels depressed, behaves passively, and displays guilt feelings that cannot be explained easily. This primary identity usually is not aware at first of the other identities, although the others might talk about the primary identity in depth. For example, one of Sybil's identities was Vicky, who often commented to Dr. Wilbur about Sybil's life and the lives of the other identities. Other symptoms include attempted suicide and self-inflicted injuries, such as cuts or burns. Many people with multiple personality disorder also show signs of post-traumatic stress disorder * , a mental disorder that occurs in people who survive a terrifying event. They may have night-mares and startle easily, and they may show signs of depression, anxiety, substance abuse, and eating disorders. How Common Are Multiple Personalities? From 25,000 to 250,000 people in the United States have multiple personality disorder. The estimates vary greatly, because the disorder is difficult to diagnose. People with multiple personalities tend to have a wide range of symptoms that can be confused with other, more common disorders. As a result, it typically takes at least six years for a diagnosis of multiple personality disorder to be made. In recent years, the number of cases being reported has risen sharply. Some say that this is because doctors are becoming more aware of the disorder's symptoms. Others, however, are concerned that the disorder is being diagnosed in some people who are open to suggestion about memories of childhood trauma. How Are Multiple Personalities Diagnosed and Treated? In order for doctors to say that a person has multiple personality disorder, they must see two or more distinct identities. Each identity also must become the dominant personality for a time. In some cases, doctors may talk to the patient for long periods or ask the patient to keep a journal between visits, in hopes of learning more about the different personalities. Doctors sometimes also use hypnosis * to bring out different identities. The goal of treatment is to bring the separate identities together into one primary identity. Therapy attempts to help the person recall past trauma and deal with emotions without the primary identity being split into parts. Success is possible, but treatment can take many years; it took about 11 years for Sybil's 16 personalities to blend into one. * post-traumatic stress disorder (post-traw-MAT-ik STRES dis-OR-der) is a mental disorder that interferes with everyday living and occurs in people who survive a terrifying event, such as school violence, military combat, or a natural disaster. * hypnosis refers to a trance-like state, usually induced by another person. The person under hypnosis may recall forgotten or suppressed memories and be unusually responsive to suggestions. Schreiber, Flora Rheta. Sybil. New York: Warner Books, reissued 1995. The book about the famous case of Sybil Dorsett has sold more than 6 million copies. National Alliance for the Mentally Ill, 200 North Glebe Road, Suite 1015, Arlington, VA 22203-3754. A self-help organization for people with serious mental illness and their family and friends. The group offers information about multiple personality disorder on its website. American Psychological Association, 750 First Street NE, Washington DC, 20002-4242. The American Psychological Association provides information about psychotherapy and referrals to local psychologists. Its website posts a fact sheet about memories of childhood abuse.